This month in the teen room, we have so many fun things going on! Summer may be around the corner, but hang tight! This month we’re celebrating libraries and what they mean to us for National Library Week! This year’s theme for National Library Week is “Libraries = Strong Communities”. Please share with us how the library impacts you and write on the room display, either “what the library means to you” or “why you’re visiting today”. Doing so may result in a piece of appreciation candy! 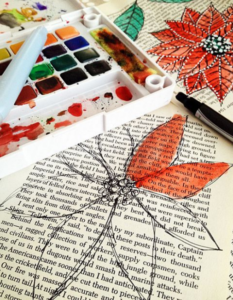 Also, partake in the National Library Week themed makerspace with book art, page painting, or paint a book end! For those of you more drawn in by mind puzzles, the giant Sudoku board in the hallway may be for you! If you haven’t already taken a survey about ideas for our upcoming podcast, please do so! Your voice is very much heard and is being taken into consideration! Podcast Surveys are found on the tables of the teen room. Another way to use your voice in the teen room would be to give us suggestions on what to rename this “Can’t Stop Reading” teen blog (meta, right!). As long as the language is appropriate, all suggestions are welcome! Leave your vote in the specified ballot box on the teen room desk! National Library Week also happens to fall on Volunteer Appreciation Week! Since September, our teen volunteers have given us a total of 472.75 hours of precious time! 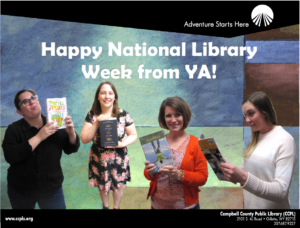 From everyone in YA, we appreciate all that our volunteers do for us and the library. You guys truly make our community a better place! Check Out Our Soaring Eagle Award Winners! 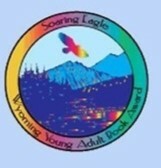 Another big thank you to those who participated in reading and voting on our Soaring Eagle books this year! The winners have been posted and we’re even more excited to see what next year’s Soaring Eagle nominees will hold! I’m going to start off by saying that graphic novels are so much more than just superhero comics or manga (although those are awesome, and you should read those too!). There are a lot of graphic novels out there that don’t get the love and attention they deserve. 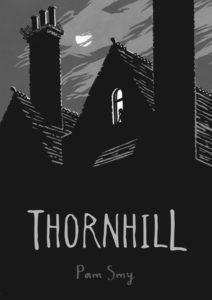 For this post, I’d like to touch on two graphic novels that are amazing. These are available at our library, so come and check them out! Let me start off by giving you the premise of this story: in some parts of rural China, people are selling the corpses of females. Why, you ask? Well it’s all part of a custom called “ghost marriages”. In this ancient tradition, husbands and wives are meant to share a grave, and if a man dies unmarried, essentially a piece of him is missing. To solve this problem, families will buy the dead body of a woman, marry the two dead people in a ceremony, and then bury them together. Mhmm that’s right! That’s only the beginning, friends. You can use your imagination to figure out just how people are “collecting” these women. Or you can read this graphic novel and find out for yourself! Part laugh-out-loud funny and part deeply moving and heavyhearted, this graphic novel is also paired with beautiful artwork. I hope you give it a chance; you won’t regret it. In fact, you might check out more than once! Now it’s no secret that I’m a huge fan of Jeff Lemire. 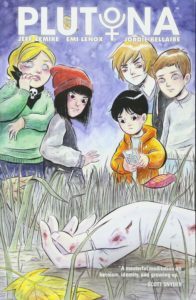 He’s written some great stuff (Essex County, The Descender and Sweet Tooth series, and a lot more) and Plutona is one of the great Young Adult graphic novels that he has published recently. Not only is the artwork super cool, but the story is just spot on. Speaking of the story, let’s get into that. Imagine you have a favorite superhero (mine’s Batman) and you and some friends uh, you find him or her…dead. In a forest. You are seemingly the only ones who know this secret. What do you do in this situation? That’s the dilemma that Teddy, Dianne, Mie, Mike, and Ray find themselves in. This is a superhero tale with a twist, and I’m betting you’ll enjoy this graphic novel. It’s one of those that are really hard to put down. Good luck with that! You may have heard the saying ‘those who forget history are doomed to repeat it’ or some variation of it. That being said, not everyone likes to read history text books; a great way to learn historic facts is reading historical fiction and lucky for us there were two great historical fiction novels on this year’s Soaring Eagle list. Let’s take a look at those now! London, 1888: In the heat and humidity of late August, a serial killer terrorizes the low-class East End district, Whitechapel, murdering women and brutally dismembering their bodies. He becomes known as “Jack the Ripper” for the gory, bloody murder scenes he leaves behind. Audrey Wadsworth, raised in an upright Victorian-era family, feels compelled to solve the murders, to figure out the identity of “Jack the Ripper” before he strikes again. Even though the women he kills are viewed as “throwaway” women by most of society, Audrey knows that no person deserves to die in such horrific murders. 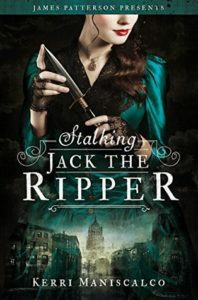 As she becomes dangerously involved with the murder investigation, Audrey slowly realizes that “Jack the Ripper” may be closer to her than she thinks. Could he be her eccentric uncle, who has his own personal collection of human organs and is always seeking more? Could it be the handsome, yet aggravating, Thomas – a fellow student in her uncle’s secret forensic science classes? Or could it be someone even closer? Perhaps, even, someone in Audrey’s own home? Michael O ‘Shaunessey is a thirteen year old boy growing up in Nazi Germany. Like any teenager he loathes the grown-up dinner parties, making small talk, listening to adults discuss Hitler and “the War”. Unlike most teens, Michael has a huge secret. He goes to school daily as part of the Hitler Youth Corp. He is a good soldier by day: doing everything required of him to move up in the corp and prove his loyalty to Hitler and Germany. At home when he leaves school and the public eye, he keeps his family’s secret: they work for the Allies, feeding information through the Irish embassy they work for to help the Allied Forces. Although Michael is just a kid and not actually a spy, he finds himself challenged daily not to challenge the evil he sees happening all around. Children were encouraged to turn their family members in for violating any small rule; boys beat each other to just to prove their loyalty to the Fuhrer. Michael befriends a new boy at school and protects him from the bullies. 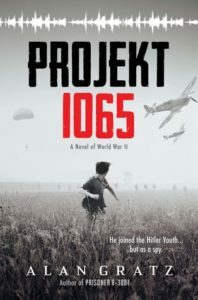 As he gets to know his new young friend he discovers the secret of Projekt 1065. Michael is determined to somehow get a copy of the plan and pass it on to his parents to send to the Allies. The story keeps you questioning with Michael , what would I do if I had to choose between doing what is necessary and doing something wrong. Now, if you’ve been keeping up you’ve noticed we keep mentioning ten titles but we have only done nine; that’s because some titles don’t really fit well with any of the other books. 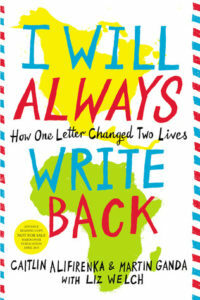 This year that book is I Will Always Write Back, this is a nonficiton title. Don’t let the fact that it’s nonfiction scare you away, as this book will demand your attention. Two people, two very different lives. Caitlin lives in Virginia, while Martin lives halfway around the world in Zimbabwe. Two individuals who by all means should have never met each other quickly become close lifelong friends. Everyone in Caitlin’s class wrote a letter to a penpal in a distant country. Martin is one of the lucky few in his class to receive a letter, which happens to be from Caitlin. As they correspond with each other, they learn how vastly different their worlds truly are. As Martin struggles to find ways to pay for school and feed his family, Caitlin struggles with backstabbing friends and dating. Even with the differences they have, they find peace and understanding through one another. From their first letter all the way to their first meeting, we see how a letter can spark a friendship that lasts decades, a friendship that changes both individuals for the better. There you are – all ten Soaring Eagle Nominees for 2018-2019. Voting is going on now through Mach 15, for our teens, 7th-12th grade, at your public library or at your school library. If you have read three or more of these books, you can vote for your favorite, as well as nominate another book to be on the list next year! 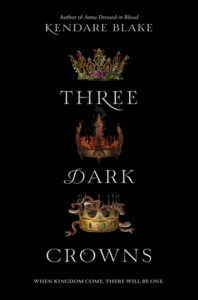 If you haven’t read three,stop by your libraries to check some out, or visit our Libby app. Happy readings!!!! If you were ever curious about the tech options for teens at the library, there are plenty of different technologies for you to explore! 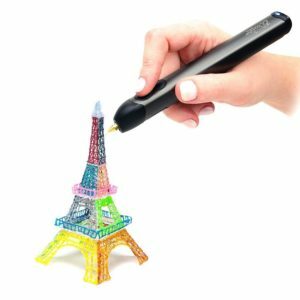 3D pens – Draw awesome 3D objects with our 3D pens! From statues to glasses frames, there are a ton of fun things you can create. Use your imagination! These will be available for you to use in the makerspace for the first couple weeks in March. 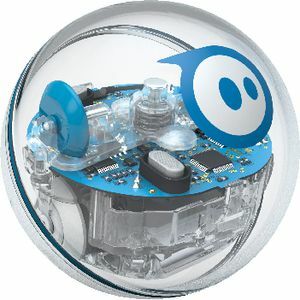 Spheros – These round robots are a ton of fun. You can create your own coding system – they’ll go wherever you guide them! You can use a code someone else has created or create your own! Your sphero will dance, have a light show, and make various sounds. 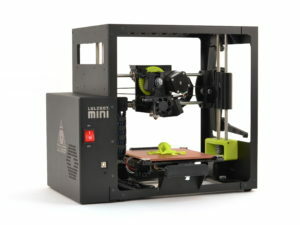 3D Printer – Have you ever used a 3D printer? Now’s your chance to find out how cool they are. You can print out basically whatever you want (besides things outlined in our library policy) and we have a variety of filament colors as well. On Wednesday, March 6 teen librarians will be explaining how to use them and will provide an opportunity for you to print something. During the month of March 3D prints are free for teens, 7th-12th grade! 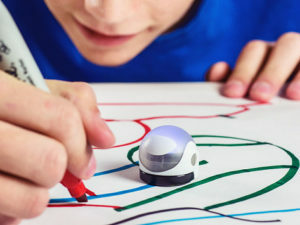 Ozobots – these little robots follow a code that you put before them and can create a variety of shapes and follow a lot of different paths. You can draw these paths yourself or use a coding system to teach your bots new tricks! Here in the teen room we have two original ozobots and one Evobot. With light effects, sounds, and a variety of movements, the options are endless! The teen room also has two iPads, 4 internet computers, more robotics, a computer lab for you to use whenever you need to do homework and much more. Come down and explore all we have to offer! 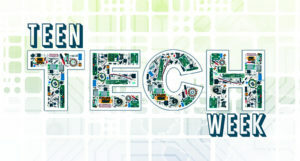 See you during Teen Tech Week March 4-8! The end is near! Though there is still time to read a Jennifer Nielsen book! From February 20-22 at our local junior high schools, catch our visiting New York Times bestselling author, Jennifer A. Nielsen! 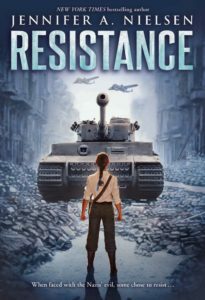 Jennifer, the author of historical fictions such as Resistance and A Night Divided, will be visiting 8th grade classes at your school soon. For those who are fans of books that take you to whole new worlds, Jennifer is also the author of the Mark of the Thief and Traitor’s Game series! Anyone who loves reading, writing, history, fantasy, or just wants to pick an author’s brain will enjoy her presentations. For those who may miss Jennifer at school, join us at Campbell County Public Library Friday, February 22 at 6:30 pm in the Wyoming Room for a presentation by the author! If you are interested in purchasing a book, a selection of Jennifer Nielsen’s books will be available for purchase and autograph at all events throughout the week. 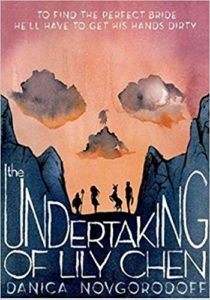 Jennifer A. Nielsen is a Youth Author from Utah who most enjoys writing fantasy and historic fiction. She particularly enjoys writing historical fiction, as seen in Resistance and A Night Divided. 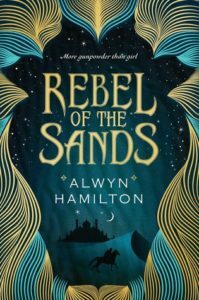 She also particularly enjoys writing about characters who are rebellious and strong in the face of oppression. Capturing important messages in characters facing hardship, there’s a Jennifer Nielsen book to capture all ages of readers. Voting’s coming fast! Have you read at least three of the 2018-2019 Soaring Eagle Nominees? No?! Fantasy just isn’t your thing? None of the last three caught your eye? Never fear! This week we’ll show you three realistic fiction and one mystery from this year’s list. Realistic fiction is great for readers who want to be taken out of their lives but not taken out of the real world! Willowdean is fat. She’s always been fat. 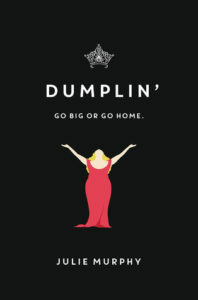 Her mom – a former beauty queen who hasn’t quite left that part of her life behind – affectionately calls Willowdean “Dumplin.” But Willowdean doesn’t mind being fat; she actually likes her body, and she doesn’t care what other people think. Usually. In Willowdean’s hometown, Clover City, the Miss Teen Bluebonnet beauty pageant is THE measure of a girl’s worth, and nobody even considers someone like Willowdean entering the pageant. Especially not her mom; she diets every year so that she can fit into the dress she wore when she was named Miss Teen Bluebonnet years ago. Her overweight daughter as a candidate in her precious pageant? Unheard of! Why should being a certain size determine beauty, Willowdean wonders? And with that – and with her customary sass – Willowdean sets out to shock the town of Clover City out of its prejudices. In Willowdean’s words, “I get called a freak everyday. I might as well make a show of it.” But in the process, it turns out that the person Willowdean is most likely to shock… is herself. 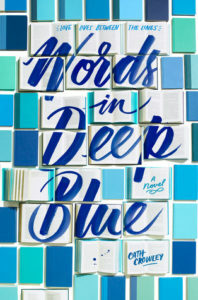 Rachel’s world is crumbling around her since her brother drowned off the coast of Australia in the ocean she once loved. Mired in grief, she has let everything go, even failing her grade 12 exams. In a final desperate attempt to pull her out of the nose dive her life has taken, Rachel’s mom sends her back to live with her aunt and work for the summer. The only problem? Her aunt lives in Rachel’s old hometown where, years ago in a moment of either insanity or bravery, she confessed her love for her best friend in the pages of his favorite book and he never responded. To make matters worse, her aunt gets her a job in the bookstore his family owns! Henry works at his family’s derelict second hand book shop, but he loves it. What he loves most is the letter library; a small section of used books where people can mark the pages, leave letters, or send their thoughts out into the future. Things aren’t easy with the failing shop and his disintegrating family life, but at least he has his beautiful girlfriend, Amy … until he doesn’t. To complicate matters, his best friend Rachel is back in town, after having cut ties with him years ago without any explanation. She looks different, and worse, acts different. At first, she’s cold and aloof and won’t talk to him, but then agrees to help him try to get Amy back. As Rachel and Henry catalogue the annotations in the letter library, they find out that even though everything is changing, some things remain the same. They discover that hope and healing are possible for them both IF they can get on the same page. Those are the rules of the neighborhood. When Will’s brother Shawn turns up dead, Will, like so many others, sets out to get revenge. Will thinks he doesn’t care what happens, as long as he gets revenge. Once he hops in the elevator he starts to have second thoughts, and it’s a long way from floor 7 to the bottom floor. It’s even longer when, on each floor, someone new steps on. It’s longer still when those people aren’t supposed to be there anymore. 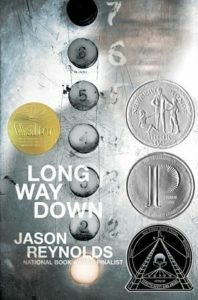 Jason Reynolds’ newest novel, Long Way Down, is written in verse. February 1982: Mary lives every day at Thornhill Home for Orphans, beleaguered by a cruel and unpredictable bully. The home has been ordered to close, and while many of the girls are rehoused, Mary finds her world shrinking in on itself. It seems that nobody wants to foster the semi-mute, pale and withdrawn Mary. The only comfort Mary finds is in crafting detailed puppets and reading in the quiet privacy of her upstairs room. But as the staff and students leave, one by one, Mary finds herself alone with her tormenter until she is faced with a life or death choice. March 2017: Ella’s story has no words- we only see flashes of her life, punctuated by black pages and interlaced with Mary’s story from decades before. The images come together to give clues to Ella’s isolated life; pictures of an absent mother, notes from an overworked father, and the view from an upstairs window that overlooks Thornhill and the promise of a mystery to solve. 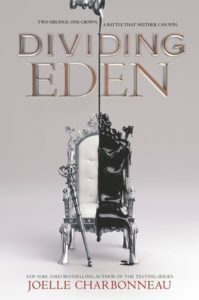 As Ella discovers more about the mystery surrounding the overgrown gardens she begins to see that maybe she and Mary have more in common that she realizes, and that sometimes loneliness is the worst torment of all.